It's not often the spotlight is shined on an 18-year-old in the Pioneer League with 47 career games to his credit. But that's the situation for Kevin Maitan. 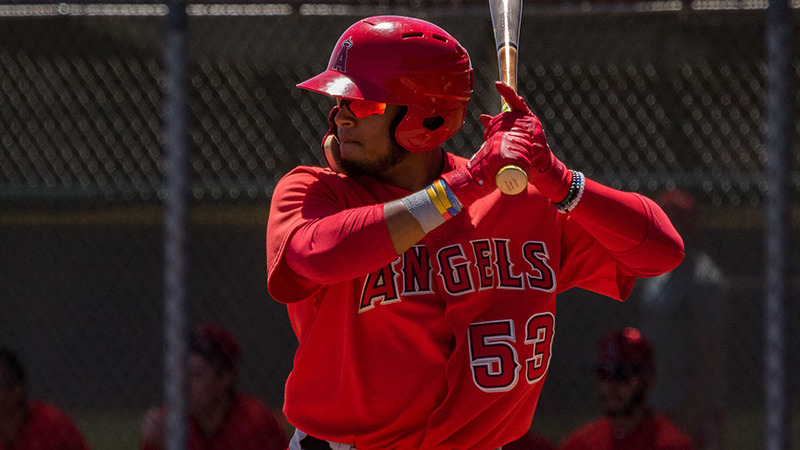 The second-ranked Angels prospect tied his career high with three hits and scored a run as Rookie-level Orem rallied in the ninth inning to defeat Ogden, 3-2, on Wednesday at Lindquist Field. Maitan led off the ninth with his third single of the night ahead of a game-tying homer by Orlando Martinez. "I just told him to relax, take a good approach and don't change anything you've been working on," Orem manager Dave Stapleton said. "He started things off for us and went up there not thinking too much. Just hit the ball hard and don't overdo it." Maitan entered the contest having hit safely in Orem's first four games. He made it five straight with a single to left field in the first, then reached on an infield hit in the third. It marked his second straight multi-hit effort and third of the season. The Venezuela native struck out swinging in the sixth before starting the ninth-inning rally. "We certainly like what we're seeing from him, not only at the plate but also defensively," Stapleton said. "He's taking a leadership role and we continue to stress playing the game the right way. It was really nice to see what he did out there tonight on both sides of the ball." MLB.com's No. 77 overall prospect is batting .450/.522/.450 with two walks, two RBIs and two runs scored in five games in his second professional season. He batted .241/.290/.340 with 11 extra-base hits and 18 RBIs in 42 games with the Braves' Rookie-level clubs in the Gulf Coast and Appalachian leagues as a 17-year-old. The switch-hitter is said to have pop from both sides of the plate and he's already drawn comparisons to Hall of Famer Chipper Jones and Tigers slugger Miguel Cabrera. "Kevin impresses me more and more every day," Stapleton said. "He does things on the field that make you turn and go, 'Wow, he's only 18?' He's truly accepted a leadership role and is doing a great job with it. He's got a lot of upside and it's just a matter of us bringing him along and not letting him beat himself up too much over failures. He expects so much of himself." The Braves had signed the shortstop to a $4.25 million deal in 2016, but an investigation by Major League Baseball into the club's international signing practices led to disciplinary action from commissioner Rob Manfred. Maitan and 12 other players in the Atlanta system were released from their contracts and declared free agents last Nov. 21. The Angels took advantage and inked Maitan to a contract with a reported $2.2 million signing bonus on Dec. 5, providing a jolt to a quickly improving system. "I haven't seen [any signs of pressure] with him," the Orem skipper said. "We try to keep an open line of communication with him and help him understand the process of it all. Things are going to go wrong on the field, particularly at this stage. It happens and it's all part of the learning process. He's very hard on himself, but that can also be a driving force. We just stress for him to be on time, get his work in and do what he needs to do. He's going to be just fine." The tying blast was the second in three games for Martinez, who's second in the league with eight RBIs, one behind Idaho Falls' Manny Olloque. Tim Millard scored the go-ahead run on an error by third baseman Jefrey Souffront. Owlz starter John Swanda, the Angels' 27th-ranked prospect, allowed three hits and struck out five over four scoreless frames. Zack Kelly (1-0) picked up the win after yielding two runs -- one earned -- on three hits and a walk with three strikeouts in four innings. Jake Lee worked around two hits in the ninth to earn his second save. Jeremy Arocho singled twice and drove in a run, while Alvaro Rubi doubled and singled for Ogden. Raptors starter Jose Chacin yielded two hits and two walks while fanning a career-high seven over five scoreless innings. Vinny Santarsiero (0-1) did not retire a batter in the ninth and was charged with three runs -- two earned. Michael Avallone is a contributor to MiLB.com. Follow him on Twitter @MavalloneMiLB. This story was not subject to the approval of the National Association of Professional Baseball Leagues or its clubs.